"My goal in life is to go to the Olympics ... I have a coach who thinks I can do it." My name is Camila Silva and I'm from Chile. I've been living in the United States for almost three years now. But I've been speed skating for five years both in Chile and here in the U.S. My goal in life is to go to the Olympics, but every time I think about it I feel like I'm never going to get there. My problem is I'm a speed skater doing inline skating on a track. 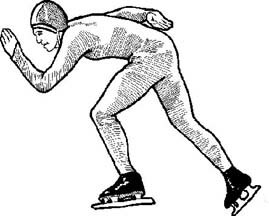 But I want to go to the Olympics to speed skate on ice. I had never tried ice skating before coming to the U.S. because in my country we do not have ice skating. But because I have a coach who thinks I can do it and because I'm so excited about going to the Olympics, I'm willing to do everything I can. Because the technique between roller blading and ice skating is so different, it is going to take me a lot of time to get there. Right now I am training very hard. I have practice on Mondays and Tuesdays when I have to wake up at 5:00 in the morning so I can get to the rink at 6:00 and practice with my team. Then after practice I have to go to school. That is not all. After school I have inline practice and then I try to do my homework during the night. I stay up late and then wake up real early in the morning. People might think that this routine is a sacrifice for me, but I don't think it is. I think it is more a sacrifice for my mom and dad. But for me this is an exciting opportunity to get ready for the Olympics and grow as a person, too.